A project will be as successful as the project manager is committed to be. Our project managers are experienced specialists that have conducted more than 20 projects each, and they are in position to create realistic plans for software development (estimation of effort and time), and to execute the plan with the right output in terms of productivity and quality. 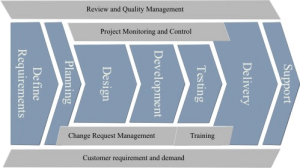 Nearshore-Romania practices Software Development Methodology made of seven steps ensuring control over the process, as detailed below. Put acceptance tests into effect.